Our internal rigging partner, JCALPRO, is available to perform aerial rigging in the exhibit halls, ballroom, function areas, and designated exterior areas of the convention facilities. You can also choose from a variety of technical support services, which include lighting, audio, video, projection, and elaborate staging setups, as well as production and stage management. 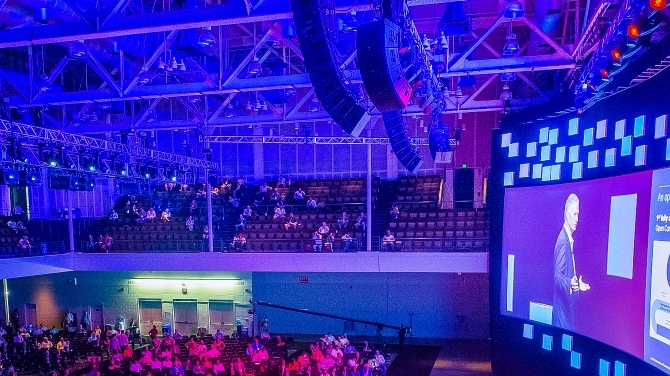 Signature Boston also offers customized rigging and lighting solutions for exhibitors with more complex or unique requirements. This option is best suited for exhibitors with larger signs, multiple signs, and/or overhead lighting. JCALPRO offers package rigging solutions. Packages include all lifts, labor, and rigging equipment – cables, pipes and hardware – necessary to install and remove signs and banners. We also offer solutions for special rigging requirements. Or you can use your own General Service Contractor. Lighting kits include a combination of Lekos, Source 4 Pars, and Par 64s – based on layout and design requirements. This option is especially suited for those with larger signs, multiple signs, and/or overhead lighting.